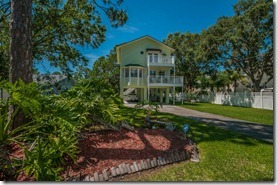 Key West Home in Oldsmar! SOLD!!! 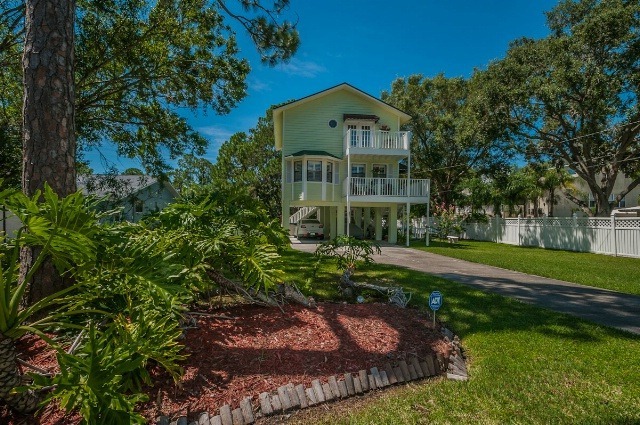 You’ll find a taste of Key West with a modern twist in exquisite Oldsmar! This 3 bedroom, 2.5 bath delight is nestled at the end of a gracefully long driveway rimmed by tropical foliage. A classic bay window & white picket fence accent the spacious yard. Exquisite lattice walls & a wide outdoor staircase surround the entranceway leading to the second floor’s rear balcony with tree top views and awnings for delicious shade. The backyard’s covered patio has pavers with matching stepping stones out to the luxurious hot tub. Indoors, stunning plantation shutters highlight the Great Room outfitted with a charming bay window niche, gas fireplace & entertainment center that joins the dining room to form the perfect relaxation/entertainment area. Oversized sliders lead to the deck from the gleaming kitchen; you can linger over morning coffee or host a beautiful brunch. You’ll love the low maintenance Pergo floors throughout, with lush carpeting in the bedrooms. Besides the sleek & updated powder room, the guest & master baths are also warmly contemporary. The master bedroom boasts peek-a-boo water views from its private deck whose French doors flood the master suite with natural light. With a newer roof, AC, kitchen appliances & water heater; your new home is just down the street from RE Olds Park with its scenic views, playground, trails, fishing piers & picnic shelter as well as Mobbly Bayou Preserve’s 225 acres of land with canoe launch, beach area & dog park. https://trinityeastlakerealestate.com/wp-content/uploads/2018/03/LC-WebLogo-340x156-300x138.png 0 0 loricrawford https://trinityeastlakerealestate.com/wp-content/uploads/2018/03/LC-WebLogo-340x156-300x138.png loricrawford2012-08-03 06:30:292012-08-11 08:37:54Key West Home in Oldsmar! SOLD!! !